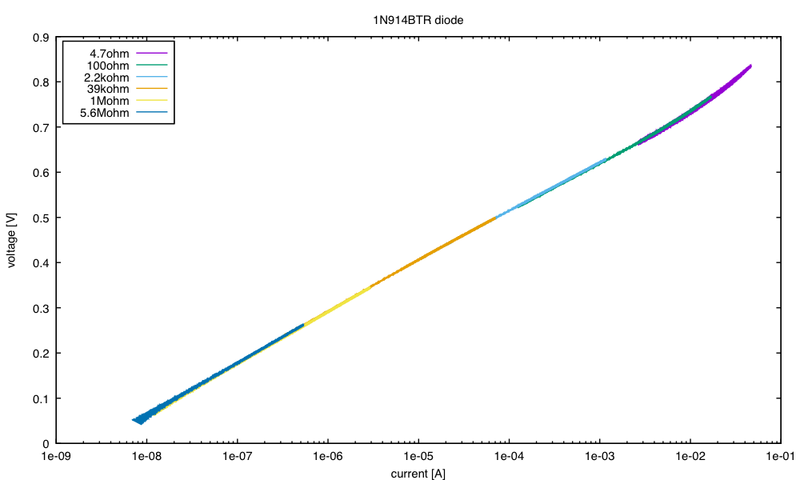 Forward voltage as a function of current for a 1N914BTR diode. would let students see that the voltage grows approximately with the logarithm of the current, and that means that a voltage difference corresponds to a current ratio. Very few students got that from the picture, the formulas, or the description in the text. They almost all wanted to pretend that the diode was a linear device with voltage proportional to current (i.e., that it was a resistor), so that a 6% change in current would result in a 6% change in voltage. The whole point of using the diode was to introduce the exponential non-linearity, so this confusion definitely needs to be cleared up. I was going to try to explain semilog plots and exponential/logarithmic relationships in class today, but my cold has gotten so bad that I had to cancel class today. That means I have another 2 days to figure out how to explain the concepts. If any of my readers can think of ways to get students to interpret semilog plots correctly, please let me know. I think that the relationships are too obvious to me for me to help students past their misunderstandings—I can’t get far enough into their mindsets to lead them out of confusion. I spent the entire long Presidents’ Day weekend grading and still did not clear my backlog (the cold I’ve had for the past two weeks has really reduced my ability to work long hours). I did get a homework set graded and a design report set graded during the 3-day weekend, but I was left with a set of 18 redone lab reports that I still hadn’t gotten to. Wednesday produced another set of redone reports (so I now have about 35), and Friday produced another homework set (which I just finished grading after spending all Saturday—I haven’t even gotten dressed yet and it is almost 8pm). Tomorrow I’ll tackle the first set of redone reports, assuming my cold lets me do anything tomorrow. In Disappointment with chain stores, I commented on no longer wanting to grade in the Peet’s coffee shop I used to grade in, and commenter “Mike” wanted to know what solution I came up with. This winter, I’ve mainly been grading in my breakfast room at home, using a tiny laptop (an 11″ MacBook Air, which we bought for travel and for lecturing) when needed to look things up (data sheets, my solution sets, the exact wording in the book, …). This has worked out ok this year, though I do tend to wander into the kitchen for snacks a bit too often. Still, the snacks at home are healthier than in a coffee shop! Many students reported using a 3.3V power supply without measuring it, resulting in inconsistent information, such as VOH > 3.3V. PteroDAQ reports the power-supply voltage on the GUI and in the metadata for the data file, so the data was available, even if the students hadn’t thought to measure it while in lab. Equations are parts of sentences, not figures and not objects dropped randomly on the page. Treat them grammatically as noun phrases. Explicit figure credit is needed any time a figure is copied or adapted. The caption must say something like “figure adapted from …” or “figure copied from …”. Failure to do so is plagiarism, and I’ll have to start academic integrity proceedings if students fail to do proper figure credits in future. Don’t bury the lede. Start with the design goal, not with generic background. A lot of students still wanted to give me a bunch of B.S. about what hysteresis was, before telling me that they were designing a capacitive touch sensor using a relaxation oscillator built around a Schmitt trigger. The subjunctive mood marked by the auxiliary verb “would” is used for many things in English, but technical writing primarily uses just one: contrary-to-fact statement. “The inverter that we would be using” says that you didn’t use that inverter and are about to say why. A lot of students seem to think that “would be” is some formal form of past tense—they’ve seen it in writing, but never understood what it means. I fault their middle-school English teachers for not stressing the importance of more advanced grammar than the bare minimum, but the fault could have been corrected in high school or in college composition classes, but still persists. Students are still using way too much passive: “It was decided …” should be replaced with “We decided …”. Part of the problem here is that much of the writing they are exposed to overuses passive also—excessive passive is a common writing error for scientists and engineers, not just students. “Firstly”, “secondly”, “lastly” ⇒ “first”, “second”, “last”. These are already adverbs and don’t need an “-ly” ending. Strangely, I never see the corresponding problem with “next”, though it is in the same class of words that are simultaneously adjectives and adverbs. There are a lot of words that are compound words as nouns, but separable verb+particle pairs as verbs. For example, “setup” is a noun, but “set up” is a verb. Other examples include layout, turnaround, pickup, putdown, stowaway, flyover, and setback. Many students are using “proportional” wrong, for any increasing function. The phrase “f proportional to d” means f=kd for some k, not just that f increases with d. Similarly, “T inversely proportional to d” means T=k/d for some k, not just that C decreases with d.
Capitalize at beginning of sentence and proper names only: “Schmitt trigger” not “Schmitt Trigger”, “Figure 3” but “many figures”. Figure names, table names, and equation names are proper nouns, so should be capitalized: “There are three figures on the last page: Figures 4, 5, and 7”. Hyphenate a noun phrase used as a modifier for another noun: “Schmitt-trigger inverter” but “Schmitt trigger”. I’ve been enjoying the videos at http://everysecondcounts.eu/, which were started by a Netherlands comedy show in response to Trump’s America First speech. They made a fake tourism video, with an excellent Trump voice impersonator, arguing for making the Netherlands second. Other comedy shows soon took up the challenge creating their own mock tourism videos (I particularly liked Denmark’s entry and Germany’s). There are now nine videos, with more undoubtedly in the pipeline. Today in class I did a demo where I tested the dependence of the frequency of my relaxation oscillator board on the power supply voltage. The demo I did in class had to be debugged on the fly (it turns out that if you configure the power supplies of the Analog Discovery 2 to be low-speed waveform channels, then you can’t set them with the “Supplies” tool, but there is no warning that you can’t when you do the setting), but otherwise went well. One surprising result (i.e., something else that hadn’t happened when I tested the demo at home on Sunday) was that the frequency appeared to go up instead of down when I touched the capacitive touch sensor. 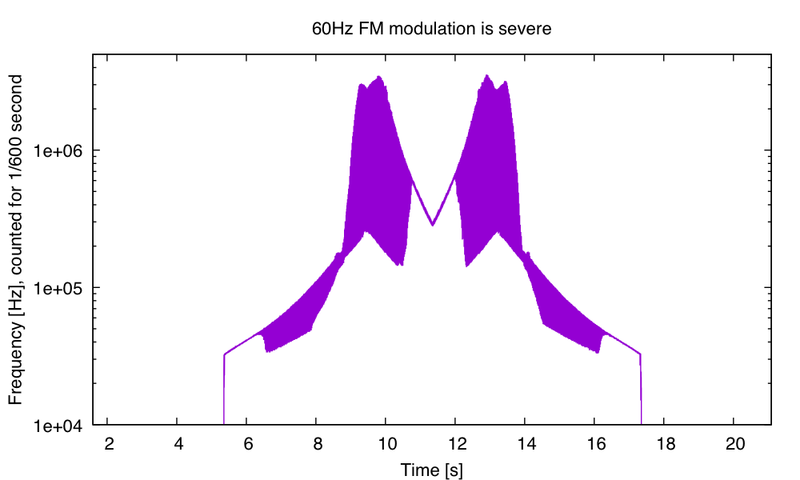 This I managed to quickly debug by changing my sampling rate to 600Hz, and observing that the 60Hz frequency modulation was extreme at the podium, taking the oscillation frequency from 0Hz to 3MHz on each cycle. Grounding myself against the laptop removed this interference and produced the smooth expected signal. Anyway, when I got home I was much too tired to grade the lab reports turned in today (I’ve got a cold that is wiping me out), so after a nap and dinner, I decided to make a clean plot of frequency vs. power-supply voltage for my relaxation oscillator. I stuck the board into a breadboard, with no touch sensor, so that the capacitance would be fairly stable and not too much 60Hz interference would be picked up. I powered the board from the Analog Discovery 2 power supply, sweeping the voltage from 0V to 5V (triangle wave, 50mHz, for a 20-second period). I used the Teensy LC board with PteroDAQ to record both the frequency of the output and the voltage of the power supply. To protect the Teensy board inputs, I used a 74AC04 inverter with 3.3V power to buffer the output of the hysteresis board, and I used a voltage divider made of two 180kΩ resistors to divide the power-supply voltage in half. 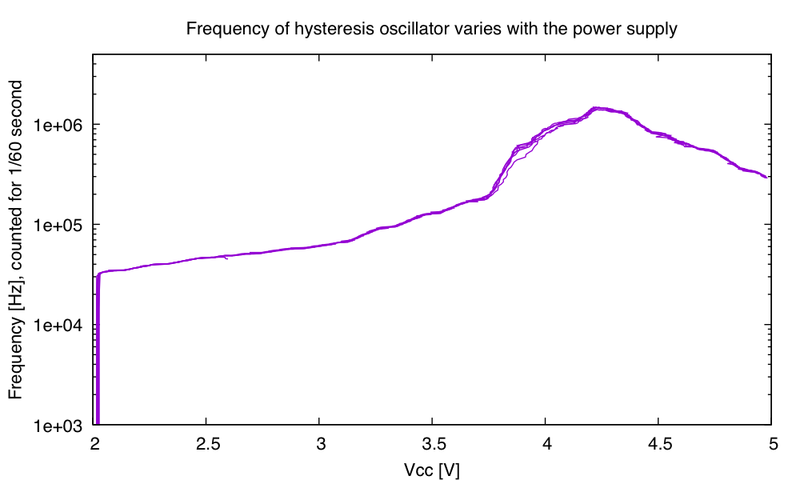 At low voltages, the oscillator doesn’t oscillate. The frequency then goes up with voltage, but peaks around 4.2V, then drops again at higher voltages. 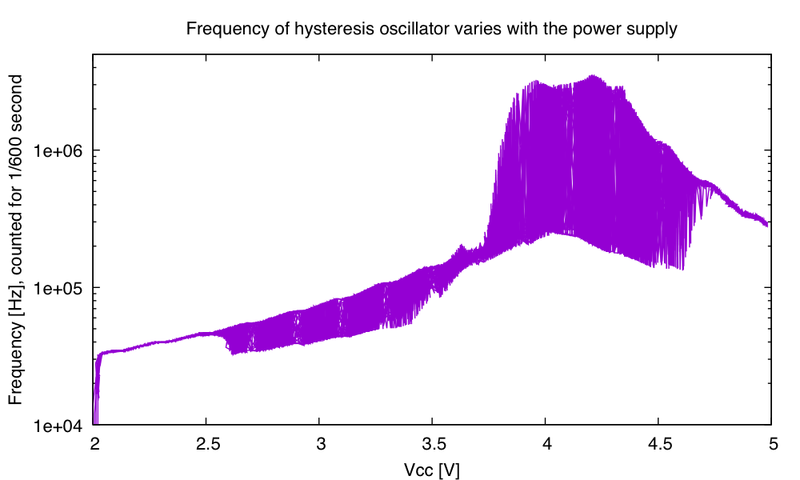 I expected the loss of oscillation at low voltage, but I did not expect the oscillator to be so sensitive to power-supply voltage, and I certainly did not expect it to be non-monotone. I need to heed my class motto (“Try it and see!”) more often. 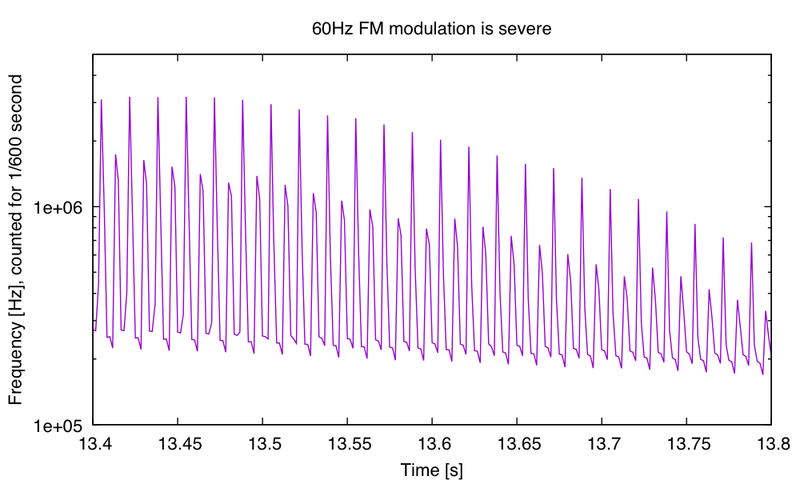 Using 1/600 second counting intervals for the frequency counter reveals substantial modulation of the frequency. Zooming in on a region where the frequency modulation is large, we can see that there are components of both 60Hz and 120Hz. I could reduce the 60Hz interference a lot by using a larger C and smaller R for the RC time constant. That would make the touch sensor less sensitive (since the change in capacitance due to touching would be the same, but would be a much smaller fraction of the total capacitance). The sensor is currently excessively sensitive, though, so this might be a good idea anyway.